The U.S. Census Bureau today released an interactive, online map pinpointing the wide array of languages spoken in homes across the nation, along with a detailed report on rates of English proficiency and the growing number of speakers of other languages. The 2011 Language Mapper shows where people speaking specific languages other than English live, with dots representing how many people speak each of 15 different languages. For each language, the mapper shows the concentration of those who report that they speak English less than "very well," a measure of English proficiency. 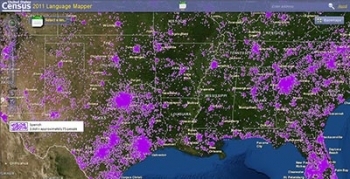 The tool uses data collected through the American Community Survey from 2007 to 2011. "This map makes it easy for anyone to plan language services in their community," said Nancy Potok, the Census Bureau's acting director. "Businesses can tailor communications to meet their customers' needs. Emergency responders can use it to be sure they communicate with people who need help. Schools and libraries can offer courses to improve English proficiency and offer materials written in other languages." The languages available in the interactive map include Spanish, French, French Creole, Italian, Portuguese, German, Russian, Polish, Persian, Chinese, Japanese, Korean, Vietnamese, Tagalog and Arabic. After selecting one of these languages from the menu, users will see a national population density map, with each dot representing about 100 people who speak the language at home placed where these speakers are concentrated. The map also allows users to zoom in to a smaller geographic area, where each dot represents 10 people. The dots were placed in a random location within census tracts to protect the confidentiality of speakers. Also released today, the report, Language Use in the United States: 2011, [PDF] details the number of people speaking languages other than English at home and their ability to speak English, by selected social and demographic characteristics. It shows that more than half (58 percent) of U.S. residents 5 and older who speak a language other than English at home also speak English "very well." The data, taken from the American Community Survey, are provided for the nation, states and metropolitan and micropolitan areas. The report shows that the percent speaking English "less than very well" grew from 8.1 percent in 2000 to 8.7 percent in 2007, but stayed at 8.7 percent in 2011. The percent speaking a language other than English at home went from 17.9 percent in 2000 to 19.7 percent in 2007, while continuing upward to 20.8 percent in 2011. "This study provides evidence of the growing role of languages other than English in the national fabric," said Camille Ryan, a statistician in the Census Bureau's Education and Social Stratification Branch and the report's author. "Yet, at the same time that more people are speaking languages other than English at home, the percentage of people speaking English proficiently has remained steady."